I have decided to get back into the flow of writing monthly reports so hopefully, March gets things going, it’s been a rough month, I’ve had quite a few health issues coming down with flu then glandular fever, which on top of all the problems knocked me a bit. However works been going well, with a couple of new clients wanting up to date business looking websites and another wanting a web application so that’s been keeping me on my toes but also resulting in radio time being pushed quite hard. You’ll find out though it’s been a good month for new satellite contacts. This month I added a 20 turn helix from Wimo, with a stated gain of 13dB it should, in theory, be decent, it’s wired back to the shack with a 20m length of LMR400. What has surprised me is the limited number of people who seem to use AO-92 L/V so far only working G0IIQ, OH5LK and PE1JPD. 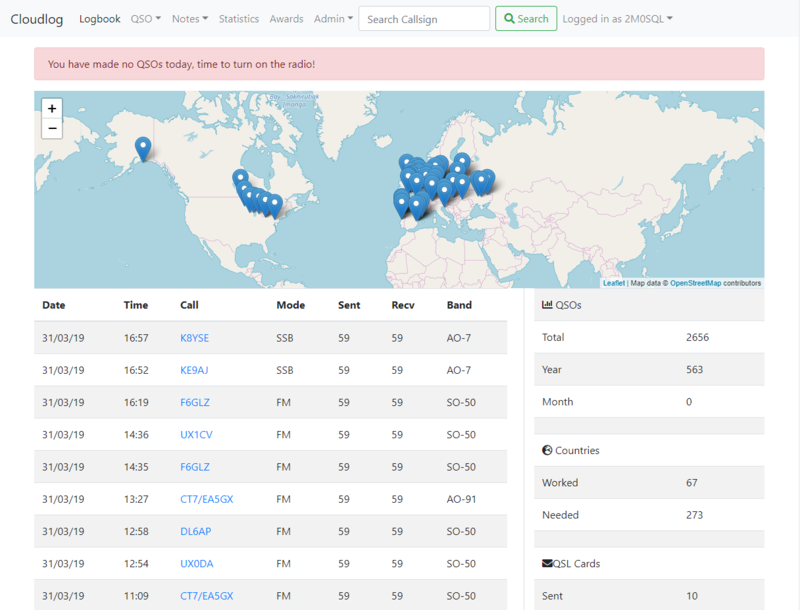 It is working well as I can activate the AO-92 repeater with just 2 watts from the radio but 10 watts from the ICOM IC-910 does give good results. However have to look at the long term, this will be useful once ESEOs FM Repeater gets activated and I suspect we might see further satellites use 23cms uplink to spread some of the congestion seen on 2m and 70cm. 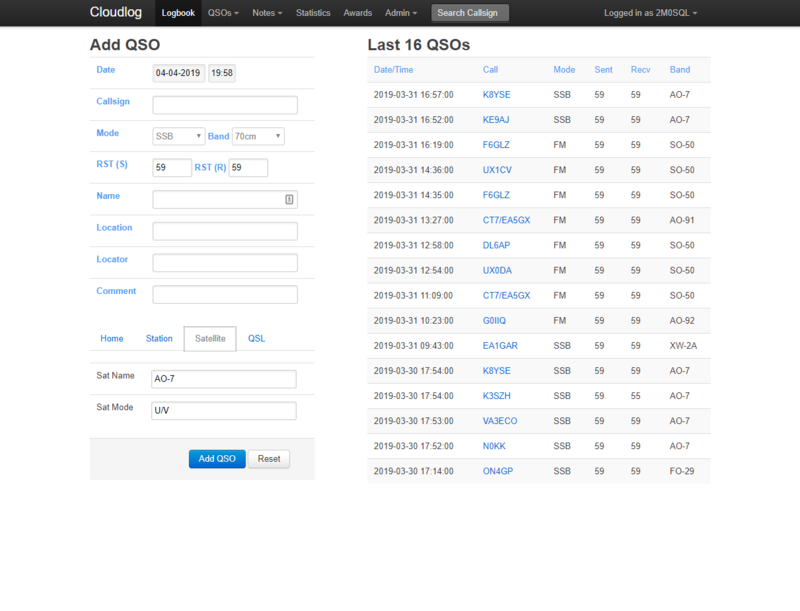 Some perhaps aren’t aware that for some time now I have been making my own logging application called Cloudlog, but instead of it running on the desktop it runs on a web server and you use it within the web browser. This is then supported by a number of desktop applications/scripts that do rig control. March saw quite a reasonable amount of work on it, as you can expect there’s a fair amount of legacy code and one of the biggest issues was the frontend was using a very old version of Bootstrap which is a user interface framework so my focus has been moving to the latest version and trying to give Cloudlog a more modern feel. Of course, being the fact its open source its freely available for anyone to use at no cost and quite a few users contribute changes and fix bugs which are always appreciated. W5PFG in FN57, FN67 on the 2nd of March via FO-29 this was thanks to a tip-off from Dave KB1PVH. Joe KE9AJ provided me with DN70MD on the 5th of March, then EM19 on the 13th, both via AO-7. Gabe AL6D has been in Europe from the 2nd till the 13th of March operating as LY/AL6D (KO16) Lithuania, YL/AL6D (KO26) Latvia, RA/AL6D (JO94) Kaliningrad, OH0/AL6D (JP90) Aland Islands, OH/AL6D (KP20) Finland. This provided me with a couple of new DXCCs & squares, but importantly confirmations on ARRLs LoTW system. The 16th of March was a good day working IU1LBM in JN43 via XW-2D for a new square, then E74KM appeared on a SO-50 pass on the 16th of April in JN85 Bosnia-Herzegovina, this was a nice surprise as not only was it a new country for myself, it was his first satellite contact I later found out via email. Ron AD0DX/VE3 was active on the 28th of March on the 17:57 AO-7 pass in EN95, FN05. Gabe AL6D after his European trip went out in his plane on the 29th of March and activated BO69 which was a new square, also missed another square due to AO-7 flipping modes which is always frustrating. Later on, that day also worked KE9AJ in EN53 for a new grid square and also Wisconsin state. These are of course only the contacts which stood out and was a part of many contacts over the month, it was good to hear new UK / French stations on FM passes and now as we’re in spring I hope this will only increase although passes might become a bit congested. During the weekend of the 23 to 24th of March, the operator of Diwata-2 released a schedule for the satellite to enable the FM Transponder which is U/V. On the 23rd I was able to open the satellite and put some calls through it, one thing I did notice was that it needed a bit more power at around 20w and I lost access at 10 degrees and below on elevation. On the 24th I had arranged to have a contact with Peter G0ABI which we completed and tried to get a few more contacts but no one else was heard. It was back on during the 30th of March and worked G0ABI, DK3WN and EA5TT on the 14:13z pass sadly doesn’t seem to be getting much use but maybe people not aware of its temporary scheduling. Since moving into the current house, all the cable runs have just run across the garden with the hope everyone will stand over them, which is fine, but as runs increase its become a bit of a pain, so I took the decision to purchase some PVC pipe from the local hardware store and have fed all the runs down two sets of pipes to the house. This comes up a post where I’m going to terminate anything that doesn’t need to come inside, or adding surge protectors to coax, the next steps getting a more permanent hole in the side of the house for bringing cables in. Always good to work you Joe, thanks for the squares always appreciated. Very interesting report Peter, I can see I have some catching up to do when my 70cms is sorted, hopefully next week. Nice to see a few mentions of me. 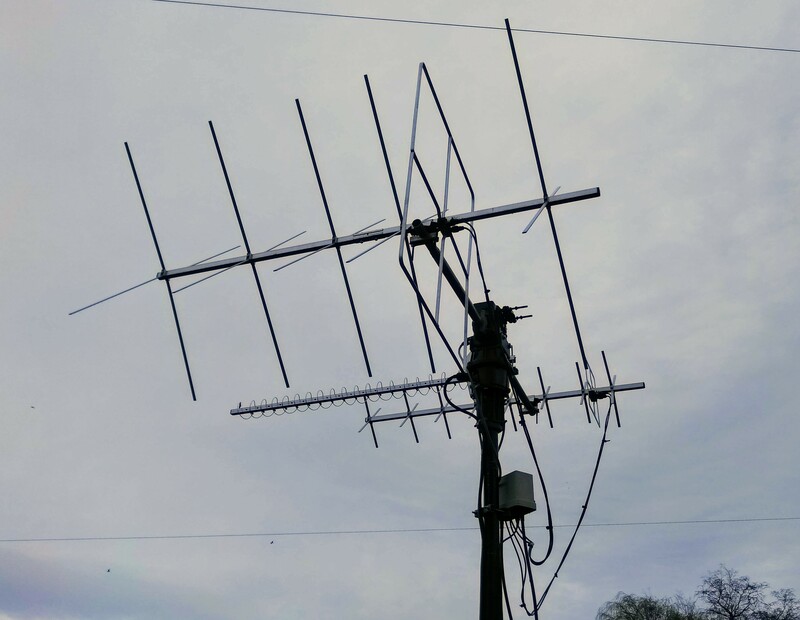 Hopefully 70cms is an easy fix, be good to get you on Diwata-2, must try AISAT-1 this weekend if I can find a station whos actually at they keyboard on APRS! Thanks Les, look forward to catching you over the weekend no doubt!